· View, search, print, and subscribe to reports. · Create, secure, and maintain the folder hierarchy to organize items on the server. · Configure role-based security that determines access to items and operations. · Configure report execution properties, report history, and report parameters. · Create report models that connect to and retrieve data from a Microsoft SQL Server Analysis Services data source or from a SQL Server relational data source. · Set model item security to allow access to specific entities in the model, or map entities to predefined click through reports that you create in advance. · Create shared schedules and shared data sources to make schedules and data source connections more manageable. · Create data-driven subscriptions that roll out reports to a large recipient list. · Create linked reports to reuse and repurpose an existing report in different ways. · Launch Report Builder to create reports that you can save and run on the report server. Report Manager is used only for a report server that runs in native mode. It is not supported for a report server that you configure for SharePoint integrated mode. Some Report Manager features are not available in SQL Server Express with Advanced Services. 1. Open Microsoft Internet Explorer 6.0 or later. 2. In the address bar of the Web browser, type the Report Manager URL. By default, the URL is http://<ComputerName>/reports. 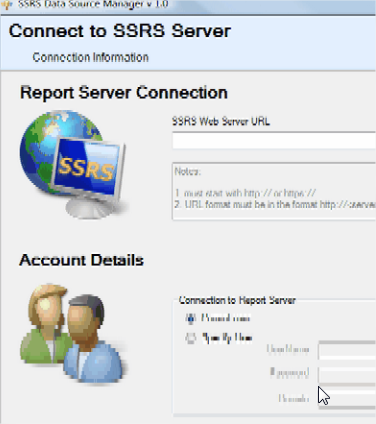 The report server might be configured to use a specific port. For example, http:// <ComputerName>:80/reports or http:// <ComputerName>:8080/reports. SSRS 2008, like its previous version SSRS 2005, is built to address the needs of three different audiences. One audience is the business decision maker (or Business user). The Report Builder is targeted for Business users. These are users who have a deep knowledge of their data but may have either no detailed database knowledge or no serious programming experience. However, they are very much involved in slicing and dicing the available information to get a better handle on their business activity for decision making, analysis or forecasting. Report Builder is an ad hoc report design tool that utilizes a business model built using the available data. · Create and save reports on the fly. Supports any SSRS-supported data source including Model, SSAS, SQL RDB, SQL Azure, SQL Server Parallel Data Warehouse, Oracle, Teradata, SAPBW, Essbase, etc. Report Designer is a collection of graphical query and design tools that are hosted within the Microsoft Visual Studio environment. Report Designer provides a Report Data pane to organize data used in your report, and tabbed views for Design and Preview so that you can design a report interactively. 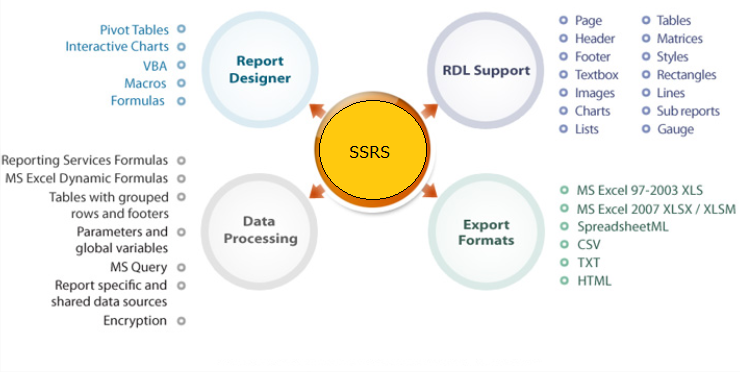 Report Designer also provides query designers to help specify data to retrieve from data sources and the Expression dialog to specify report data to use in the report layout. Report Designer supports table, matrix, and free-form list reports; charts, gauges, and maps. While designing a report, you can test it locally before publishing it to a report server. When you select the Preview tab, Report Designer runs the report using the same processing and rendering extensions that the report server uses, ensuring that users see the report as it was intended when they run the report. When you are ready to publish your report, use Report Designer to publish the report to a report server. Report Designer is the primary report development tool available from the SQL Server Business Intelligence Development Studio (BIDS). The design surface now supports a richer designer experience with rulers and snap lines. The Data tab in Report Designer has been replaced with a Report Data pane that organizes all report data into one place, and it is always visible as you create the report layout. It shows data sources, data sets, parameters, images, and built-in fields. Other changes include a new grouping pane that provides a convenient way to create groups for a Tablix data region and new property dialog boxes to set report item properties. When you choose to create a Report Server project and add a report, the design interface also gets displayed. The design interface, also called the Report Designer, consists of a Toolbox with report related items, Design and Preview panes and a Report menu items drop-down, all shown in the same figure. To get the Report menu items you need to click on Reports. These completely take care of the physical layout and formatting of the Report. The process of building up the report begins by placing (drag-and-drop) controls that can display data on to the body of the report, which, to begin with, is empty. Then you drag-and-drop the Report data items one-by-one into the controls that can bind to the data. When you use the Report Wizard however, the above activities will take place under the wizard’s guidance. The Expression… menu item is a common tool whenever you are required to build an expression consisting of built-in fields, database fields and others. This utility has a long history of usage in Microsoft Access from its earliest versions. As shown in the next figure, two database fields are concatenated together to provide a value to be placed in the textbox by creating an expression. The expression is set by choosing Category | Item |Values in that order and any logical or mathematical operators chosen again from the Operators. Visual Studio also provides other design help items like object handles, rulers, object grouping, and snap-to-grid alignment features. Some of these features become visible when you are dragging and aligning objects with respect to each other on the design surface. The design surface is shown in the following screenshot as a blank report with no data defined. These design tools must be utilized to get an aesthetically pleasing report.